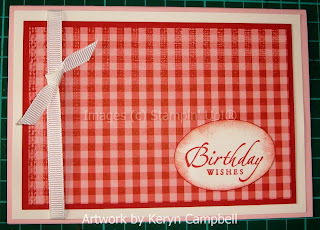 Sponging is a fabulous way to soften cardstock edges, to add colour to the edge of cardstock to avoid using another cardstock or paper layer, to gently soften stark white cardstock. Either use a full size sponge or cut it into six or eight trianges. Dab it into your inkpad and gently apply it by gently dabbing or dragging to your cardstock or paper. Gently really is the key as it's easier to add colour than take it away. 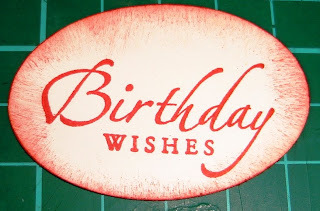 - Birthday wishes (Sincere Salutations) stamped in Red Riding Hood Ink and punched out with a wide oval punch. - Softened by sponging the same ink around the edges. 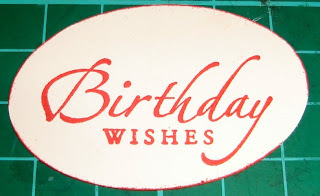 - Then add to a card.